SPRING COHO BITE!!! Tackle Haven is NOW open 7-days a week and it is now time for your 2019 Fishing License so stop in and renew before your next adventure out on the water. The Spring Coho bite has now begun and it's still not too late nor to soon to launch out of port Benton Harbor/St Joseph. Anglers have just begun to get their boats out on the big lake and have been locating the coho in close and along the shoreline from the pier heads on down south to the Cook Nuke plant. Search for the warmer water pockets and that is where you will find your best luck while it is early in the season and water temps are still cold and below 40 degrees. Steelhead fishing on the St Joe river has been good with the best reports coming just below the Berrien Springs Dam. Anglers are having their best luck on drifting with wobble glo's and corky's as well as drifting spawn. Mag Lip's size 3.0 and 3.5's are a good option as well as some Hot N Tots. Walleye season on the river is still closed until the end of April. Congrats to Team BUSTIN CAPS on their 2018 Overall Trifecta Challenge Championship win. SPRING Hours for TACKLE HAVEN are 7-DAYS A WEEK, Monday through Friday from 7:30am - 6:00pm; SATURDAY 9:00am - 4:00pm; SUNDAY 10:00am - 4:00pm. Tackle Haven stocks a full line of Crossbows, Bolts, Targets, Cases and accessories. YES we sell COSTA SUNGLASSES! Fishing Team "MISS SHELBY TWO" Captured the 2017 Overall Trifecta Challenge. IT was A competitive 3-tourney fishing contest we had this year. Team "In the Box" finished a close 2nd place. You can see the total weights on the tournament page. Thanks to all the Sponsors (Church Tackle, Advance Tackle (Stinger Lures), Warrior Lures, Rapture Trolling Flies, Morgans Tackle, KRW Trolling Flies, Popeyes Chicken, Church Tackle and Tackle Haven) for sponsoring the 2017 Church Tackle & Tackle Haven Trifecta Challenge. Give us a call or stop by the store for a more up to date report. 2019 TRIFECTA CHALLENGE DATES May 25th, June 29th, August 24th! Tackle Haven Cell (269) 281-1951 Phil (269)208-6482 or Nate (269)208-6178. 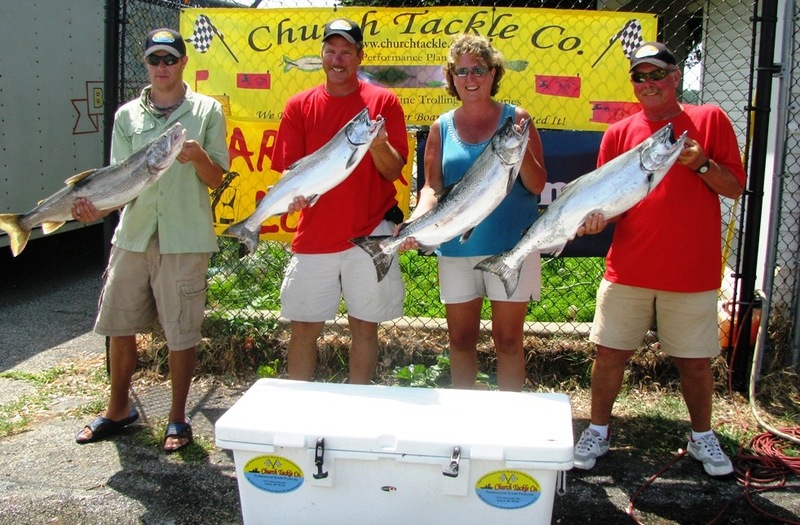 Team Coho's Aim is pictured with a nice catch from the 2nd Trifecta Challenge Tournament of 2012(Top RIGHT). Thanks for the Picture and If you want to be featured on the the Tackle Haven Fishing reports page just email us a qualifying photo to be featured with your catch. email to: sales@tacklehaven.com and in the subject line put "Fish Photo". Don't forget to Sign UP for our Newsletter to receive future online discounts in our store. THANKS!